Celebrate birds in a new and exciting way using the Ancient Graffiti Kinetic Feather Spinner. Using a spinner in your backyard highlights the area in a fun way, thanks to its moving design. This tall unit will certainly capture attention, and its copper colored finish blends with your landscaping. Each of the two spinners has six, slightly cupped feather shapes emanating from a central hub, and their specialized design and hidden bearings allow them to turn in a breeze. These dramatic toppers attach to the 55" tall, iron shaft, and its twisted design lends even more style to the item. A 15" wide, trident base on this two-piece shaft keeps the unit stable in your soil, and the 7.5" long legs make it simple to install. The copper colored finish offers a classic look in your yard, and the iron construction lasts for many seasons. 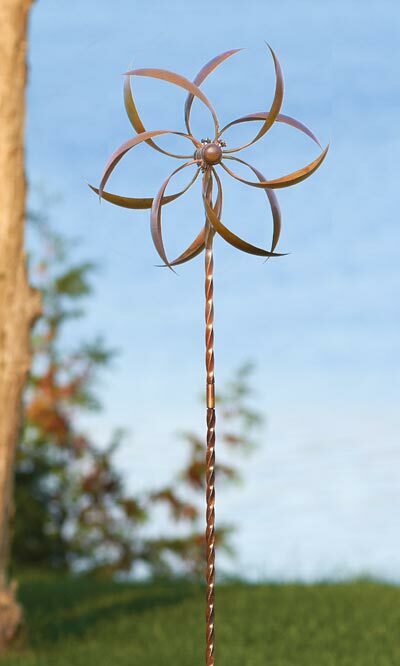 Enjoy avian-themed art in your yard with this Kinetic Feather Spinner. Assembly required.